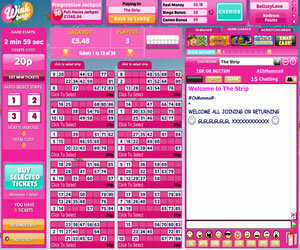 Wink Bingo encapsulates the spirit of online bingo perfectly: Clearly aimed at ladies who love to have fun, its promoters have gone for the cheeky approach to its branding, which seems to work well and is currently very popular. Although it tries to appeal to men and women, it's definitely more pink than blue - both literally and metaphorically. Registration is straightforward, as you'd expect. 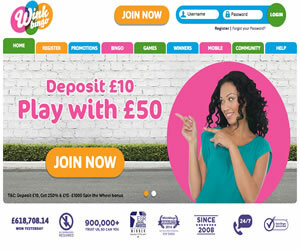 This is one of many sites run by the Joy of Bingo network, originally started by Daub Ltd but were purchased by 888 who also run the huge Dragonfish network and they know what they're doing when it comes to giving customers what they want - so there's no pressure to deposit funds. When you do, though, it's possible to pay by just about any means imaginable: they'll take all major debit and credit cards, Paysafecard, UKash, PayPal and Neteller. Withdrawals can be made via debit or credit card, Neteller (the quickest way), or by cheque. Being a 888 site you know that Wink is in good company, backed up by established, dedicated customer service so it's a safe bet that nothing will go drastically wrong when you play here. Once you click on any of the games in the lobby you're taken to a games selector with tabs running along the top to make navigation as easy as possible. Short of putting this selector on the landing page, they couldn't have made it any easier to get to the games, and you'll find most 888/Globalcom sites work this way now. There are eight 75 ball games with ticket prices ranging from the cheap and cheerful to the costly - so suiting all budgets - and eight 90 ball games again with a broad range of ticket prices. You'll also find a couple of free games, a £10,000 guaranteed game for VIPs and some other big jackpot specials for funded players. Don't go thinking this is a totally formulaic site though; here you get to play Swedish Bingo, which you won't find everywhere. It's a 90 ball game with the middle square not given free, and you win by scoring from 1 to 5 lines or mixing and matching, giving you more ways to win. Progressive jackpot games come in 75 and 90 ball format, with jackpots constantly growing from reset values of £250 and £100 respectively, and '“ of course '“ there are plenty of decent side games to choose from. The slots are way above average and can be accessed from within the rooms, with some classic titles like Shopping Spree, Can Can, Chuzzle, Snakes and Ladders, Bejeweled 2 and Secret Garden all at your disposal. It doesn't end there however, as there's also a casino games section. Strangely, though, this only contains one solitary Blackjack game, conspicuous by the absence of any other table games to keep it company '“ though it shouldn't be hard to add more of these in due course. The banter in the chat rooms we encountered was lively and undemanding '“the moderators did a great job and welcomed us incredibly quickly. 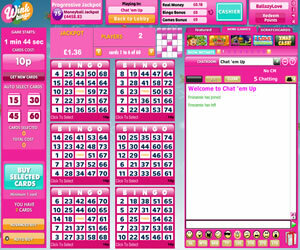 And their chat, in fact, sums up Wink Bingo quite nicely: It's easy, trustworthy, fun and friendly which is exactly what its target audience are looking for. Wink Bingo offers 90 ball bingo and two variants of the 75 ball game, the traditional pattern bingo and five-line bingo. The wagering requirements set our in the Terms and Conditions state 2x the amount of deposit and bonus received. However a withdrawal may be processed prior to meeting these requirements so long as you have deposited a minimum of £20 in your lifetime as a player with the brand but bonus funds will be forfeited at the time of withdrawal.